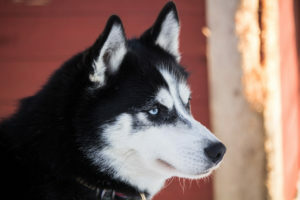 We benefit a maximum from the nature for our huskies wellbeing. Whether you are found of dogs or not, they always touch your feelings in different ways. Their wolf appearance with their thick fur and their deep eyes only make them a tender ball of fur. Excited to meet new people, there are impatient to be petted and loved. Those true shared moments will be well kept in your memories. They all have their own character: the jokers, the timid ones, the good-friends, the dunces, the pensives, the lovers, … they form a tender and affectionate patch, to which you will attach! In order to allow our sled dogs to be fit throughout the winter, physical preparation is necessary after a quiet summer resting. Workouts last from September to November, once the temperatures go down again. Although the sled dog has the urge to pull and move, it is necessary to keep them in shape, by regular, targeted and effective training. Food adapted to their nutritional needs is also required. Puppies born in our kennel are also important to us. Training them in concentration and listening is necessary for the activities we offer, and it is a long-term job! We will be happy to share with you on these topics and we will answer all your questions! The dogs allow us to make you live unforgettable moments. They are our daily life, they will soon be yours, during your trip to Lapland! A strong bond is created between you and them, especially when you drive your own team during sled rides or dog sledding and cani-rando raids. 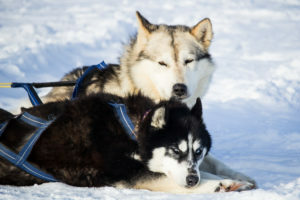 Sledge dogs are affectionate, and time seems to stop, cuddling them for hours and hugging them. 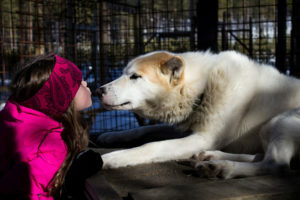 They will make your “stay in Lapland” unforgettable and unique, for heartfelt emotions in Lapland!